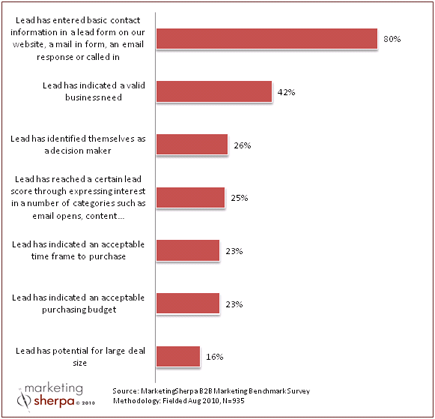 SUMMARY: We asked more than 900 B2B marketers to share what information is required in their organizations before leads are passed to Sales. In this week’s chart, learn the most commonly used lead qualification requirements. Lead qualification is an area that presents great opportunity for B2B marketers. As represented in the above chart, not many organizations are using multiple forms of qualification. For example, 80% of respondents indicated that a lead must provide basic contact information. The highest level of participation after that is 42% for an indication of a valid business need. From there, the participation levels continue to decline. Furthermore, the average number of qualification criteria selected (per respondent) to this question was only two criteria. What is surprising about this data is that fewer than half of all respondents verify that a lead actually has a valid business need for their product or service before passing the lead to Sales. For the majority, these leads may not even have a valid business need for their product or service, and they are being delivered to their sales teams to close. 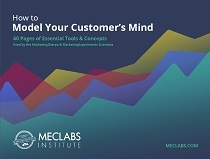 This fundamental issue can lead to number of challenges, including a lack of alignment between Marketing and Sales, reduced Sales efficiencies, and an ultimate barrier for an organization to reach their full revenue potential. For additional research data and insights about B2B marketing, download the free excerpt from the MarketingSherpa 2011 B2B Marketing Advanced Practices Handbook.